Pambazuka Press is thrilled to announce the release of 'Speaking Truth to Power: Selected Pan-African Postcards', a collection of the late pan-Africanist Tajudeen Abdul-Raheem's legendary Thursday postcards, available at £14.95 from www.pambazukapress.org. 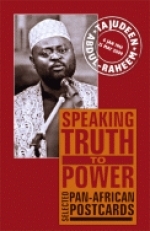 'Speaking Truth to Power' captures Tajudeen's inimitable voice, sharp intellect and irrepressible humour. PADEAP (Pan African Development Education and Advocacy Programme) is an African & Diaspora led education, campaign and support charity dedicated to empowering and educating in Africa and the UK. PADEAP promotes sustainable and practical solutions to the challenges of development in Africa and the Diaspora. Our ethos is based on a Pan African philosophy and approach. PADEAP promotes and supports the development of inter-country African skills, partnerships and expertise in seeking solutions to the challenges of peace building and development in Africa. Our projects and services are delivered from our headquarters in Kampala, Uganda and offices based in Katsina State, Nigeria and London, United Kingdom.